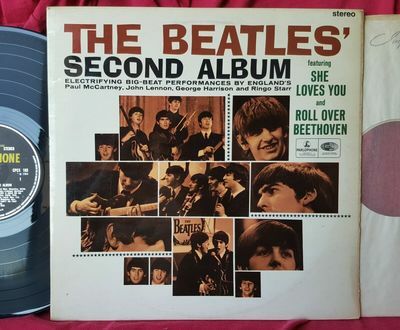 The Beatles "Second Album" 1965 Parlophone CPCS-103, produced by EMI in Britain for export only to military bases, and this vinyl is as good as it gets: NM / NM mirrory on both sides with beautiful labels (you can tell it was virtually played maybe once or twice), in addition it has the embossed tax stamp MT which was supposedly discontinued on January 1st, 1963 (most copies that have a tax stamp have the later and chronologically correct KT - however since these were export only they should NOT have a British tax stamp), the cover is outstanding and would also grade NM if not for the owner's name in black marker on the back (see photos), the 3-flipback Garrod & Lofthouse cover has almost no laminate creases (which tend to be very common on these pressings the more they are handled); it is glossy, straight, and square with pointy corners, and no seam splits; comes with the original EMITEX inner sleeve in NM condition, matrix numbers are Side 1: YEEX 110 A9, 1G...and Side 2: YEEX 111-A9, 1G, definitely a top copy (you'll LOVE the vinyl), please see all photos. U.S. buyer to pay $4.00 media mail (priority available upon request). Insurance is at the discretion of the buyer. International buyer please inquire for shipping costs which may include insurance and/or registered mail. Rolling Stones Let It Bleed MONO Unboxed Red Complete poster Sticker 1A / 1A !! CARPENTERS “Offering” LP A&M orig ‘73 first cover ~ rare NM ~ Top Copy!